In December, I signed up for my first half IRONMAN race - in Wilmington, North Carolina on October 13, 2018. When I clicked register - I knew there was a chance that I wouldn’t make it to the start line. Either a work trip would come along that I had to be at, or my legs (shins) wouldn’t get me through the training. What I really wanted was a summer spent swimming, biking and running with my friends who had agreed to sign up with me. 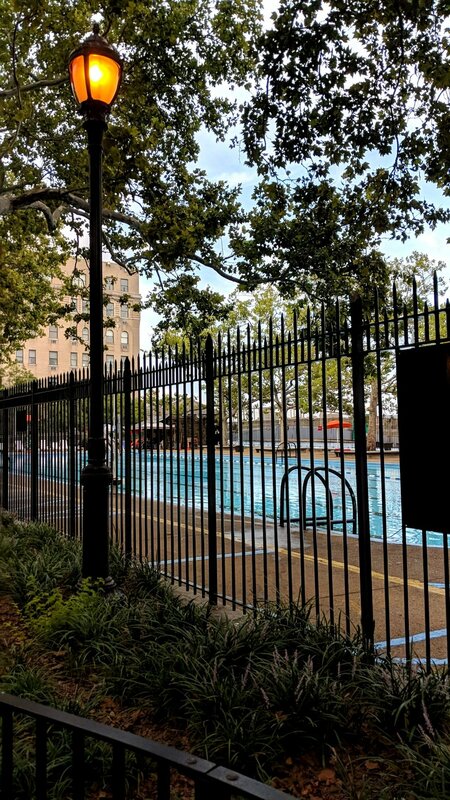 I was excited for free outdoor lap swimming at NYC pools, Saturday long rides up 9W and on Long Island, and getting myself back to weekend running and brunching with friends. Even if I didn’t become a (half) IRON(wo)MAN I knew that if I enjoyed the training, it would have been worth it. When I train for something – I tend to get tunnel vision. This 70.3 race consumed most of my spare time and mental energy from June up until yesterday. 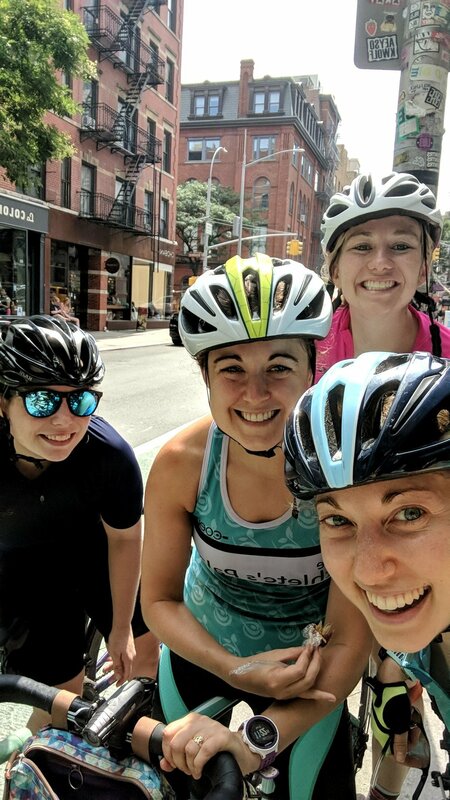 I did what I had to do to stick as closely to my training plan (this one) as possible – weekend plans meant Thursday morning long bike rides before coming into the office. Monday rest days were sacred. Foam rolling was a daily occurrence. I convinced myself that tart cherry juice was helping with inflammation and I submitted myself to 4 weeks in a row of acupuncture even though I’m terrified of needles. Made a friend! Hi Emma! I swam farther than I had ever swam before (and cried tears of joy) and found myself more and more comfortable in the pool. I biked further than I had every biked before. I PR’d Harlem Hill multiple times. I surprised myself on every transition run off the bike. I showed restraint on my weekly running mileage. Overall, I trained 1,000 + miles and I continued to tell myself throughout the 14 weeks that THIS was the accomplishment. Whether I made it to the start line and whether or not I crossed the finish line, I was so grateful for 4 months of discipline and dedication and purpose and pride. I was so grateful for 60 miles on Long Island with my best friends followed by yacht club beers with my parents. I was so grateful for open water swim practice while on family vacation at the lake. I was so grateful for the people of Clinton, NY who found me a bike to train with while I was in town for work. I was so grateful for the Friday night run to the pool followed by dinner and drinks. I was so grateful for a return to morning park loops with Tiffanie. I was so grateful for the once a week F45 training with Abby when I just didn’t want to swim bike or run for once (not as grateful for the box jump injury resulting in my shin being Steri-stripped shut). I was so grateful for vibrating foam rollers and compression leggings and the discovery of Asser Levy Pool at sunset. So when our North Carolina IRONMAN was cancelled last Monday because of Hurricane Florence, I was in a bit of a dazed disbelief, but I was also telling myself that it was OK. That the 1000 miles I trained were more of an accomplishment than the 70.3 on race day. And I still 100% believe that’s true. That’s what I’ll continue to be most proud of. But I also didn’t want to be robbed of the proof that my training had worked. That all those hours could get me from start to finish of a 70.3 distance triathlon. On Friday I happened to see a post on the North Carolina race page that MightyMan Montauk was offering $40 off registration to anyone who could show they had been registered for North Carolina. The race was on Sunday and they offered a half Ironman distance option. I texted my friends asking, “Is this crazy?” And their response of “Yes, but I’m totally in” is why I love them. I booked a hotel at 5 PM on Friday. I packed a bag Friday night. I got some sleep, woke up Saturday morning, got myself on a train, and at 3 PM I was in Montauk. 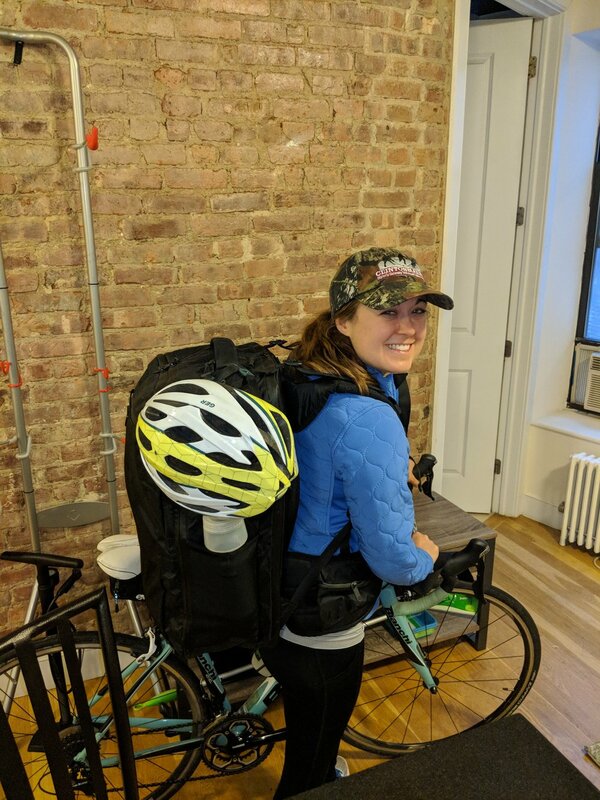 I walked myself, my bike and my massive backpack the mile to registration, paid my $200 cash, and was officially signed up 20 minutes prior to packet pick-up closing. I continued the .5 mile walk to Atlantic Terrace, checked-in, and was told that there would be a wedding happening outside our room until 11 PM. Grrrreat. Next I walked to IGA, bought a banana, walked to Herb’s, got a chicken cutlet/cheddar/avocado/spinach sandwich on a roll, took a picture of the beach, shaved my legs, put my race tattoos on, organized my stuff and crawled into bed where I sat listening to Armchair Expert until 9. I also eavesdropped on the maid of honor and best man speeches of the wedding – they weren’t that great. Around 9 I turned off the lights, popped a melatonin and dozed off until Abby and Annelise arrived at around 1 AM. That’s right, 1 AM. They’re the crazy ones. We got settled, they filled out the registration paperwork so it would be ready to go in the morning, and we all fell into bed. 3 hours and 45 minutes later, our alarms were going off and it was GO TIME. Downed some Stumptown canned cold brew, triple checked my bag, body glided the neck and ankles, triple tried to poop (and failed) and we were out the door by 5:15. It was a half mile walk to Fort Pond transition area where Abby and Annelise registered and got tatted up. The sky was starting to lighten as we made our way to the second transition area and laid out everything we would need for the run (the course had officially changed on Friday when they announced that they couldn’t hold the swim at Fort Pond due to algae levels – just another wrinkle). I ate half of my PB banana wrap, gathered everything I would need for the swim/bike and we set off on our bikes (in wetsuits and flip flops) to the swim start/transition one at Navy Beach. It was about a 3-mile bike ride and we were feeling warmed up. At Navy Beach we racked our bikes, set up what we would need to transition from swim to bike, got our timing chips and most importantly, Abby braided my hair and gave my wetsuit a loopy hookeroo. The entire time a woman was on the microphone going over the different swim courses and I was just getting more and more confused. We donned our hot pink swim caps and headed towards the water where we asked multiple people, “Do you know where we are supposed to turn?” The general consensus was just keep the buoys on your left at all times which seemed simple enough (foreshadowing – it was not simple). Everything had moved so quickly that morning that I hadn’t really had time to freak out at the fact that the water was pretty choppy looking. What I liked about the swim start was that we just waded into the water up to our chest and once they said go, people went as they pleased – once you crossed the buoy your timing chip activated. It was a lot less stressful than a jump start, though there was still a lot of kicking and splashing as people got started. At one point, I looked up and saw Annelise next to me and felt so much relief. Then I saw that she was struggling too and tried to calm us both down. It was chaos out there – and because they had used the backup swim plan, I felt like most of the lifeguards on paddle boards and jet skis were also confused as to what colored caps were supposed to be swimming where. At one point I was swimming into oncoming swimmers which yes, seemed wrong in retrospect, but I was keeping the buoys on my left like they had said! One of the lifeguards started aggressively screaming at me, telling me to stop backstroking and swim, and generally acting like I WANTED to be swimming off course. It was ridiculous. Luckily, at that point in the swim Abby and I had found each other and though we were one of only a few pink swim caps left in the vicinity, as long as I had her in my sights I felt OK. We somehow navigated to the turn buoy (me, entirely by backstroking and looking at the sky and trying to calm myself down and swallowing giant mouthfuls of salt water as waves crashed over me) and thankfully once we turned all those waves were pushing us into shore and I could finally put my swimming to use. I settled into a pattern of 10 backstrokes, 21 freestyle, sight, 10 backstrokes, 21 freestyle, sight. The times I was actually swimming were definitely the best I’ve done in open water. I could exhale this time without panicking about the fact that it was pitch black. The closer we got to the swim exit the more crowded and stressful it got but I swam as much as I could instead of standing and running on the rock bottom and dragged myself up onto the shore. I like to think I made this look partially more graceful than the others around me not used to rocky bottom swim exits. Thanks, North Shore! I knew Abby was close behind me so I took my time in transition so that we could head out on the bike ride together. I ate the second half of my wrap, put on my arm sleeves, put on my socks and bike shoes, made sure all my things were in my bag so that the race people could transport it back to Fort Pond bag check, put on my sunglasses, did the hokey pokey, turned myself about. Me, Abby and Annelise set off – “Just like any other Saturday ride!” I told myself. The first 15 miles of the bike were awesome. I felt really really good. I ate a date at mile 10 and was cruisin’ even up the very hilly straightaway to the lighthouse. The hills were hard and numerous but I was handling them well mentally. And seeing the lighthouse was so nice and memory inducing! But around mile 15 I started to get the familiar post-swim cramps. These were like NYC Tri x 128390. I couldn’t sit up straight, I couldn’t take a full breath in, I felt like I was being stabbed in the side and back and stomach and my chest was tight. I honestly started to question if something was seriously wrong. Abby passed me and I told her what was up and that I was just hoping sometime over the next three hours, the pain would go away. Even though it was the last thing I wanted to do – I knew I had to keep drinking and eating if I ever wanted to make it through the rest of the race – even though my stomach felt so so awful. The cramping was really bad for about 45 minutes and then it eased up a little but I couldn’t get out of my head telling myself that there was no way I was going to be able to run. I knew that thought was not at all useful and I needed to just focus on the bike. I never found the rhythm I had had for the first 15 miles and I knew I was going much slower than most of my training rides. I’m very bad at self-motivating on the bike – if I’m next to someone I can keep up, if I’m alone on a highway – not so easy to get my RPMs up. This was a course where you were alone a lot. But I kept going, kept eating a date every 10 miles, had half an RX bar in the last 10 miles, and swapped out my water bottle at the halfway point. I knew Abby wasn’t too far ahead of me and I kept telling myself to reach her so we could run together but my legs just weren’t having it. Eventually, the bike was over and I ran to my rack where Abby was finishing up her transition and checked on my cramp status which was definitely better than when she had seen me on the bike but also not great. She headed out and I followed behind, after changing my socks and putting on my sneakers. Last minute I decided to run with my phone in my Spibelt because I fully expected the cramps to make this a loooong, slow, walk-filled half marathon with possible phone calls crying to my parents. I left transition and started the run, clutching a melted half of an RX bar in one hand. I ran with Abby’s advice in mind – run each mile and only think about that mile. I just concentrated on getting to each aid station, where I allowed myself to stop, drink, and walk to the garbage can before starting to run again. My first mile split was 8:25 which was much slower than my usual transition runs but I figured that was safe and smart. Stomach was feeling OK, right shin was hurting, left glute pain that I’d been worried about seemed numb – all systems were go and I breathed a sigh of relief knowing that the next two hours were by no means going to be easy but that this was possible and I was going to make it happen. By the second aid station I realized that Abby was coming from behind me because she had stopped to use a porto potty at a construction site (so resourceful) and I breathed a huge sigh of relief that we could run together. I had been entering a head space that I did not want to be in – due in part to a lonely bike ride and the almost entirely crowd-supportless course. We agreed that there was no need to run up “Murder Hill” or any of the other vertical incline hills that the race creators for some reason decided to include on the run course. It was seriously unreal. 806 feet of elevation climb on a run course?! You’ve gotta be kidding me. 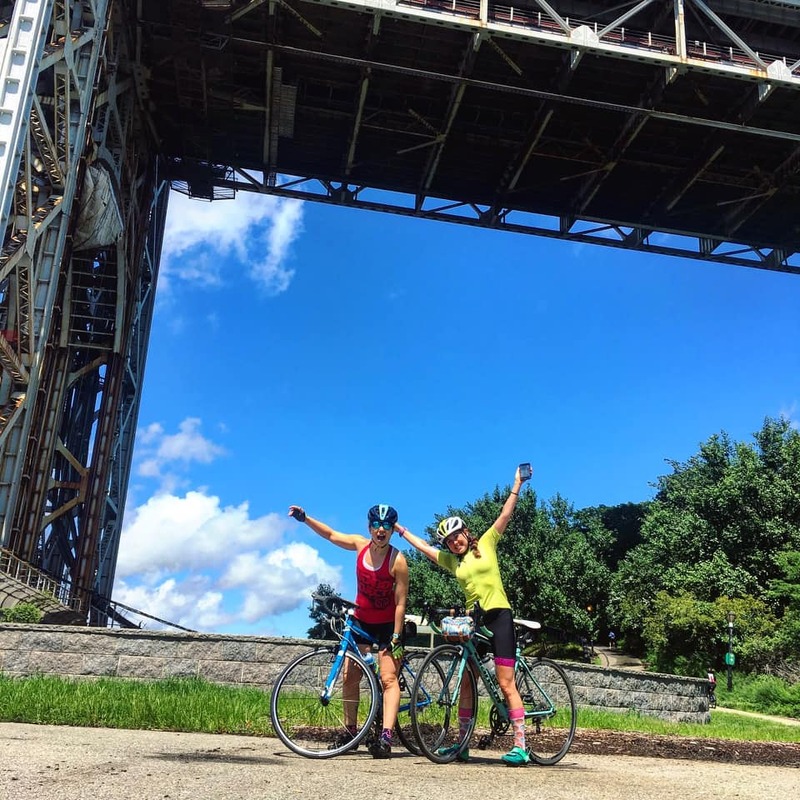 We had trained for a 56-mile bike ride with less elevation gain. I don’t know what would have happened if I didn’t have Abby next to me step after step. In true Abby fashion - steadfast, strong, positive, realistic, random (refusal to put down her orange) – I just kept doing what she was doing and I knew we’d make it. And when we crossed the finish line together, it was the sweatiest, happiest, proudest hug ever with maybe some tears - I don’t really know, everything was a little blurry. We got our medals and towels (which were not soaking wet and cold like I had hoped but still very nice towels) and gave Annelise big sweaty hugs and walked over to the food table where I demolished many many pieces of watermelon which was everything I didn’t know I had been waiting for. We zombie walked around for a little, took some photo booth pics, took some phone pics, called my dad, got some popcorn (also a great post race snack – yum salt), got our bags, got our bikes and walked back to the hotel. Things to note: my swim cap smelled like straight up seafood stew. Yuck. I somehow ripped two big holes in my $300 wetsuit. Wonderful. I was very sunburnt. It was a perfect day weather wise! I was proud that I kept myself sufficiently hydrated and fed. I was never hungry and I was peeing clear all day (this is what you get when you read a race recap, sorry). Overall the race was fairly well organized – the bike and run courses were clearly marked to differentiate between the Olympic and Half distance races. I liked that everything was super close to where we were staying. I liked that it was a small race that kept things from seeming overwhelming. I didn’t like that the swim was so chaotic, the bike course was almost entirely unsupported in terms of water/mechanics/etc., and there was no crowd support. Oh, and like I said, the run course was just stupid difficult. I would consider doing this course as an Olympic in the future though! After we all showered we got food at Gig Shack (burger, fries, beet and goat cheese salad, hummus platter with mushrooms, endive, candied macadamia nuts, parsnips – it was phenom) where there was live music and outdoor seating. Next stop was Montauk Brewery (so glad to have finally made it there!) and there double IPA was so so good. Last stop for the day was John’s (duh) for ice cream (Peanut Butter Blast) and a frozen chocolate covered banana (there’s always money in the banana stand). Abby, again, is a crazy, wonderful human and drove Annelise and I back to our apartments before driving back to her house late last night. I don’t remember falling asleep it happened so instantaneously. Nothing about yesterday's 70.3 was how I had pictured it in my head since I signed up 10 months ago. There was no time to stress about my outfit, to carefully pack my bags and to triple check my to-do lists. There wasn’t even time to MAKE a to-do list. 15 hours after seeing that MightyMan Montauk was offering day of registration and a discount for those whose Ironman NC 70.3 race had been cancelled, I was on a train. There was no expo and practice open water swim and big race night dinner with my friends. I ate a deli sandwich alone at the hotel while a wedding raged outside my window and my friends drove through the night to arrive at 1 am. We we're supposed to have a down-stream fast channel swim and a flat bike and run course. We got a chaotic ocean swim (ok it was a bay but it opens up into the OCEAN), a hilly bike, and a run with so many hills I stopped counting. I was supposed to finish with two other incredible women who supported me and pushed me and trained 1000+ miles with me. Knowing that Kayla couldn’t be there and that the unexpectedly wavy swim course rattled Annelise definitely changed the celebratory mood that we had all dreamed of and worked towards. They trained just as hard and are more than capable and beyond prepared to go the same distance. But there are silver linings to every changed plan. I had no time to doubt myself or to panic. I felt like this race was truly just a chance to give my training a shot in a scenario where I otherwise wouldn't have gotten to race at all. It cut training short when I was starting to feel burnt out anyway and it came after a week of relatively low mileage since I had been away for work. There were no delayed flights or lost bags - just a train ride to one of my favorite places. I got to complete my first 70.3 on the island that I love so much - I felt comfortable and at home. And i got to run 13.1 miles with my best friend - something I haven't done since 2016. Without you by my side for every step Abby- those last two hours would have been a lot less pretty. But your experience and steady determination kept me going and smiling and crossing the finish line with you was a definite life highlight. To everyone who has exclusively heard me talk about 70.3 training for the past 4 months ITS OVER and I'm sorry I’ve been a broken record and thank you for listening.